Plan your trip to the park! The park system first and foremost suggests mass transit and biking options. All parking is first-come first-served. Use Cap Metro's Trip Planner feature! During special events, traffic patterns typically change, or pre-credentialing may be required. Check each event website for details. Zilker Hillside Theatre hosts concerts ranging from jazz to country. Additionally, the theatre is the home of the Zilker Summer Musical and Shakespeare in the Park. Austin Sunshine Camp owned and operated by the Young Men's Business League of Austin. Zilker Zephyr - enjoy a miniature train ride around the park. 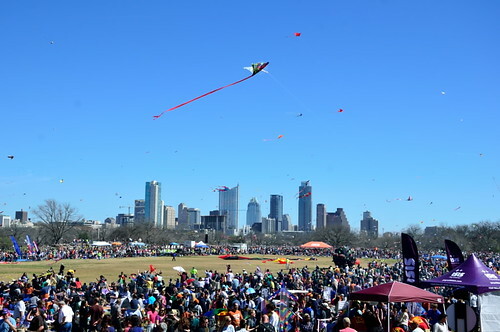 Zilker Park Kite Festival is held the first Sunday in March each year. Zilker Holiday Tree stands 155 feet tall and is composed of 39 streamers, each holding 81 multicolored, 25-watt bulbs, totaling 3,309 lights. Click on the image to enlarge it or download the map. In general, all parks are open for public use each day from 5 a.m. to 10 p.m. unless otherwise posted. At times, access is limited or affected by events or maintenance issues. To report any park non-emergency issue, call 3-1-1. Visit the 3-1-1 website to submit a maintenance concern online. Call 9-1-1 for all park emergencies.